Tom Hanks and Brian Williams attend the Boston Bruins vs. New York Rangers game at Madison Square Garden on Feb. 4 in New York. Will Brian Williams resign? Will he be fired? Williams has taken himself off “NBC Nightly News” for the time being, and he canceled an appearance on “Late Show With David Letterman.” You can read the gory details elsewhere, but essentially the longtime news anchor — a position that, at bare minimum, requires convincing most people you’re trustworthy — fabricated details about his time spent reporting in Iraq. The occupants of the chair Williams sits in — and the others like it at ABC and CBS — tend to have a reputation for longevity. You either die at the desk, or you get pushed out because you fouled up. But Williams’s term at the helm of “NBC Nightly News” — even if it ended tomorrow — has lasted longer than the average for an anchor at NBC. The average tenure of NBC anchors before Williams is 3,485 days, or about 9.5 years, which is less than the 10.2 years Williams has served (his stint began Dec. 2, 2004). ABC, which was arguably a minor network during the 1950s, had the same number of evening anchor stints (nine) in the 1950s as NBC has had in its entire history. ABC didn’t have a nightly newscast for much of 1953, and its 1951-52 show “After the Deadlines” was so minor that we couldn’t find a definitive source of who anchored it.2 Even in the past decade, “ABC World News Tonight” has had six anchors (Peter Jennings, Bob Woodruff, Elizabeth Vargas, Charles Gibson, Diane Sawyer and David Muir). Overall, the average length of an ABC News anchor has been just a little over three years. CBS News had only four nightly news anchors in its first 56 years on TV, but even there, things haven’t been stable recently. Scott Pelley is the fourth anchor (after Dan Rather, Bob Schieffer and Katie Couric) in the past 10 years. It’s a long cry from the days of Douglas Edwards, Walter Cronkite and Rather, who were each on the air for between 13 and 24 years. 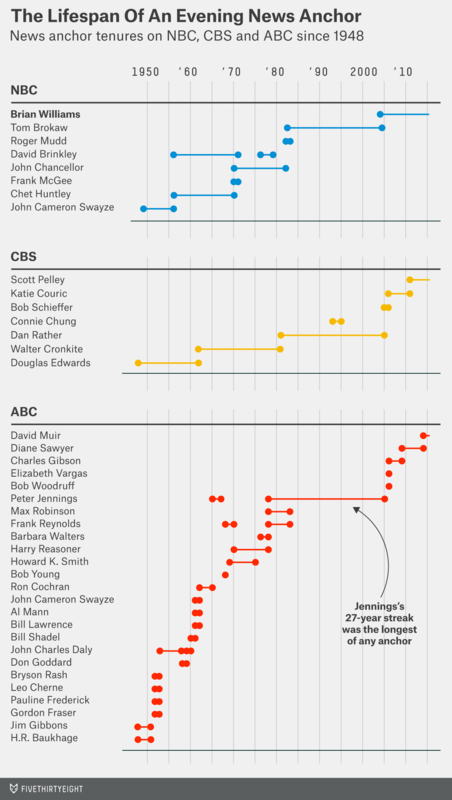 In total, the average length for CBS News anchors has been 10.8 years. Will Williams end up in the anchor seat as long as Brokaw, Cronkite or Jennings were? NBC is reportedly still deciding how to handle his situation. Maybe Williams’s fabrications weren’t earth-shattering, but in the hyper-competitive space of evening news, credibility is the only thing an anchor’s got beyond a nice suit and a nicer hairline. If Williams’s stint is coming to an end, he’s already lasted longer than most. CORRECTION (Feb. 10, 5:02 p.m.): A previous version of the chart in this article did not include Barbara Walters’s stint as a co-anchor on the ABC News evening newscast from 1976 to 1978. She is now included. If an anchor continuously hosts a show — even if someone co-anchors for a period — we counted that as a continuous period. If, however, an anchor has two distinct stints, we count those separately. If a show has co-anchors, we count those as individual terms for each. There is some disagreement over who hosted the evening program between John Charles Daly and Ron Cochran. Some sources suggest more co-anchors than others.